The prolific show horse I’m Blue Chip Too (Glen), now 20 years old is having a fantastic season having already qualified for the Richard Leeman Supreme Championship, The Veteran Horse Society Veteran of The Year and Dressage Finals and now The Anthony Evans Senior Showing Grand Final Championships at Olympia. 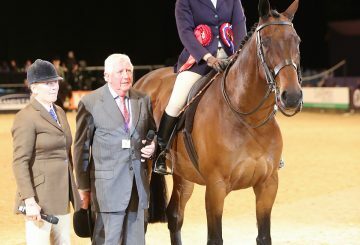 Glen is no stranger to Championships shows, having been crowned Champion Riding Horse at HOYS as a four and a five year old, as well as competing at Olympia before in the Senior Championships, where he was Reserve Champion. Last weekend Glen not only won his ridden class but then went on to win the Aintree Championship and the SSADL Championship, gaining him a place at the prestigious event in London. Glen will continue to go to some shows and dressage competitions this summer as well as ‘nannying’ Clare’s 5 year old horse and teaching her granddaughter to ride side-saddle.